Last week my job from my vacation house ran in Aftonbladet Härligt Hemma. I was on the porch, cup cake in my hand, the photographer Angelica clicking away when I tought about how much it felt like a Pippi Longstocking porch. I had just a moment to think we should have a horse up here when my neighbourg Maja where riding by with the Lilla Gubben look-a-like Blixt! We where so happy and Blixt is such a star! I showed you the drawings with the ideas for this entrance before. I chose a real hand crafted door “the Leksand” from the local company Leksandsdörren. They painted it with Falu Svart cause I wanted it to match the other old doors on our other houses. I love this old kind of paint. It is really matte and the black is sort of red, brown blackish. Very beautiful. The hanging baskets with flowers it’s a tradition from my mother in laws mum. Every summer she hanged them on that spot so I feel I have to continue this tradition! Look at the rombs in the door- such a fine job – the wood is brushed for extra patina! This is what the house has been looking like since the 70’s when they did a big renovation. Because of the small windows and the closed door it was really dark in there – and you couldn’t see anything from what was going on in the garden – such a pity. This is what the house looked like some 100 years ago. This is my husbands family. My kids are the 6th generation in this house. I like beeing here because of the history. Look at all the big lovely windows and the panel is horizontal – I love it! So I got inspired of the old windows that used to be in the house and I put in another door just for the light. I think I will paint the porch but I’ll have to wait until next year since the wood needs to dry first. Use some flour to mark where you want it to be. Also you can do other cool stuff with flour in your garden like this. Rent the machines that you don’t own or borrow from a neighbour. We had to get rid of the top of this old stairs. Renting a good machine for it saved us so much time, muscle ache and it didn’t cost much. Do a good job with the ground. Clear the layer of grass, cover the ground with mark cloth. If you buy blocks in stead of making them yourself (they need around a months time to burn) – there are some with adjustable fittings wich are great! And make sure to level both the blocks and the first frame of wood. This is how we did the frames with the studs. There are never more than 60 cm in between a stud where the floor is going to rest on and it’s not more than 120 cm between each concrete block. All the wood and the floor comes from Karl Hedin. On this image you can also see how the floor looked like. It was dark brown but allready lost a lot of color. Another tought is to make the porch larger than you think you need, if just by some centimeters. Somehow you often tend to make it too small and with all the hard work you better make it right the first time! I wish there was more sun this summer so I could enjoy the porch even more! All the top 3 images and the after-image are taken by lovely Angelica Söderberg! It looks so nice & colorful! FASCINATING. Loved the old pix! So wonderful that there is so much family history in this house! Beautiful black paint color. My mother used to have the most wonderful porch, but her current house just has a really large patio – lovely but not the same as that porch, there was just something about it…. and THE HORSE! So very Pippi! And I’m reading it to my daughter right now for the very 1st time! I just love you and your family!!! you always give me energy with your power to move on and I realy realy love so much!!!! wow this is unbelievable! cheers to your new porch! Your home is an authentic inspiration! Love your porch and all the little details you added! That door is fantastic. I love your new porch and all the little details you added! The door is fantastic. I love this! When I saw the thumbnail my first thought was “Pippi? !” She is not a bad character to emulate. :) Your porch is beautiful! Thank you marlene! 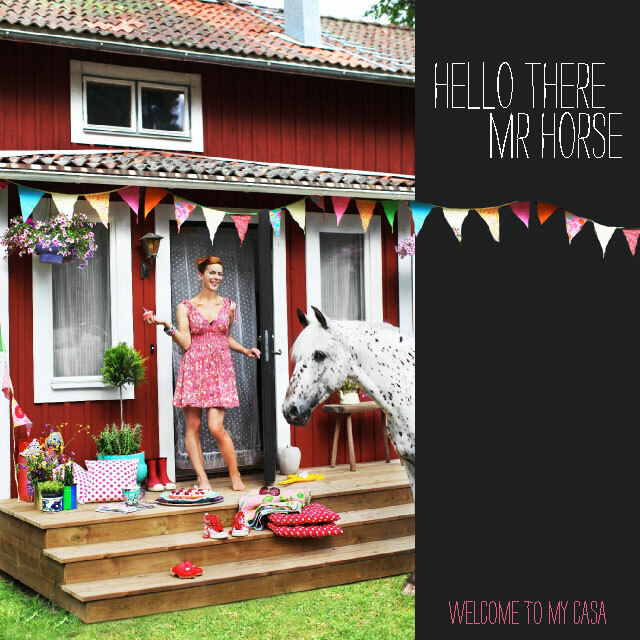 Yes she was my inspiration” and when i saw the horse i told my neighbour – come in here!